Craving a low-carb lemon dessert? These sugar-free lemon bars have a rich, zesty lemon flavor that hits the spot every time. And with only 2 grams of net carbs per serving, you can enjoy one or two without the guilt. The delicious lemon filling contains fresh lemon juice, lemon zest, coconut flour, and eggs. But the real magic is in the crust, where you’ll use one of your Perfect Keto Lemon Poppyseed Bars and mix it in with coconut oil, monk fruit, and coconut flour for a rich and satisfying bottom layer. If you’re low on coconut flour (which can happen from time to time in a keto kitchen), switch out the coconut flour for one cup almond flour. Using monk fruit as your powdered sweetener option instead of artificial sweeteners or sugar alcohols gives you a smooth, sweet flavor, along with some great health benefits. Many keto recipes, especially keto desserts, are packed with sugar alcohols, which can be tough for some people to digest. Opting for monk fruit is an excellent choice, especially if you have a sensitive stomach. Lemons, like most citrus fruits, are a great source of vitamin C. This recipe uses lemon juice and lemon zest — which means you get an extra hit of lemon’s nutrients from the peel[*]. Vitamin C gets a lot of attention as a nutrient for immune support, but it’s also excellent for heart health. A diet rich in green leafy vegetables and other vitamin C-rich foods may lower your risk of heart disease. And research shows that vitamin C levels in your blood may be inversely related to your risk of stroke[*][*]. Vitamin C may also support cancer prevention, eye health, and help you fight the common cold[*]. Hippocrates said, “all disease begins in the gut.” That was 2,500 years ago and modern science continues to prove this ancient Greek physician right. Maintaining a strong gut lining and a healthy digestive system is a cornerstone of health. Collagen, a structural protein found throughout your body, is an essential part of your gut’s connective tissue. When your connective tissue is strong it acts as a barrier between your digestive system and the rest of your body. However, when this lining becomes weak, a host of issues can occur from inflammation to autoimmune disease[*]. In fact, research shows that there’s a correlation between low collagen levels and inflammatory bowel disease[*]. Each one of these delicious lemon squares has 10 grams of fiber. Fiber is crucial for gut health because it assists in the movement of food through your system and can feed your healthy gut bacteria. There’s even research to support fiber’s role in reducing your risk of colon cancer[*][*]. Another benefit of high-fiber, low-sugar recipes is the effect they have on weight and appetite. More dietary fiber is associated with lower body weight[*]. Couple this with sugar-free sweeteners like monk fruit, and you’ll not only satisfy your sugar cravings without spiking blood sugar, but you may shed a few pounds in the process[*]. Trying to find keto-friendly dessert recipes that are made with real-food ingredients can be tricky. If you love lemon bars (and let’s be honest — who doesn’t? ), you’ve come to the right place. These tasty bars are full of dietary fiber and have a low carb count, so you won’t be jumping on a blood-sugar roller coaster ride every time you eat them. They’re also dairy-free and gluten-free, and fit perfectly into your keto low-carb meal plan. Preheat oven to 350°F and line the bottom of an 8×8 baking dish with parchment paper or grease generously with butter or coconut oil. To make the crust, beat monk fruit and softened coconut oil in a large bowl or stand mixer. Mix until light and fluffy. 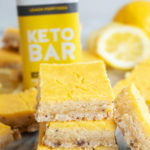 Break your Perfect Keto Lemon Poppyseed Bar into small pieces and add to a food processor; blend until you have a coarse meal. Add coconut flour, water, and Perfect Keto Bar slowly to monk fruit and coconut oil to form a dough. Press dough into the bottom of prepared baking dish and bake for 10 minutes. Remove from oven and let cool. To make the topping, add eggs, lemon zest, lemon juice, sweetener, and coconut flour to a large bowl. Whisk well until coconut flour is well absorbed and there are no clumps. Adjust sweetness to taste if needed. Pour topping over cooled crust and bake for 22-25 minutes just until top is set, but still slightly jiggly in the center. Remove from oven and let cool completely. Place in the fridge for 1-2 hours before serving.